A big step up from Cremant de Loire? Saumur is in the center of the Loire Valley, not far from much better known Vouvray. I never ran across a sparkling Saumur while I was in The Loire Valley, but spotted one on the wine list at the superb Rendezvous restaurant in Central Square, Cambridge, Mass, and was very pleasantly surprised by it. The best known sparkling wine in the Loire is Crémant de Loire, and although I've only had one Saumur Brut so far, found it a significant step up from most Crémant de Loires, which are pleasant and fun but not serious wines. Certainly it came from a serious winery which is described below. Saumur makes a variety of wines, including the rosé Cabernet de Saumur, medium sweet Coteaux de Saumur, a red wine called Saumur-Champigny, and two types of sparkling wines: Saumur Mousseux and Saumar which can be red, white or sparkling. Sparkling wine has been made in Saumar since 1811. Although also made by the traditional Méthode Champenoise like Champagne, the terroir is significantly different. Where Champagne's vineyards are chalk based, the vineyards Saumur lie over limestone, giving them a very different character. 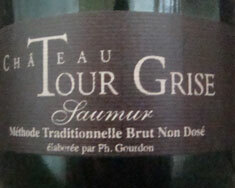 The Saumur we tried was from Chateau Tour Grise, dating back to the 1400s, although it was recently in 1990 that they had a "resumption of the vineyard" and stopped growing mushrooms. They have been organic since 1993 and biodynamic since 1998, with many miles of cool ancient cellars dug into the limestone, ideal for aging wines and similar to the cellars many Champagne houses have dug into chalk. They make many wines including whites, reds, and sparkling wines, and do tend to age them for a long time before release. Chateau Tour Grise has 15 hectares of Cabernet Franc and 5 hectares of Chenin Blanc for a total of 20 hectares of vines. Sparkling wines include their Chenin Blanc based Saumur (tasting note below), Chenin Blanc and Cabernet Franc based Saumur Rose, and a Pineau d'Aunis based wine called "Pet Zec." Pineau d'Aunis is sometimes called Chenin Noir and is a quite obscure grape variety today. Some have commented on oxidative notes in their sparklers which will not appeal to everyone. I didn't experience these at all, although as mentioned the wines are released with quite a bit of age on them. 100% old vine Chenin Blanc with no added dosage (sugar added after the second fermentation). The nose has tropical fruits, guava, almost grapefruit but more exotic, and an undercurrent of fresh figs. Sandstone, a touch of limestone, and perhaps kumquat or some other orange citrus appeared as it warmed. On the palate it was quite dry yet fruity, with light red festive fruits and fresh figs in the underbelly. Wonderful and a steal at about US$45 on the wine list! Imported by Mise Wines in Newton, Mass. Chateau Tour Grise's English language Web site.